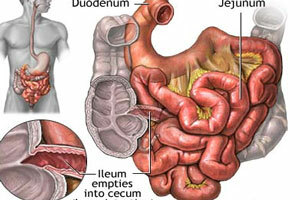 Inside a healthy lower intestine are billions of beneficial intestinal bacteria or microflora. These bacteria are of the bifidus and acidophilus strains and were transferred by breast-feeding into our intestines as newborn infants. The acidophilus and bifidus are used by the body in the final stages of digestion. They do this work and reproduce themselves in total harmony with the body. Toxins, especially drugs, can damage or destroy these beneficial bacteria, allowing harmful bacteria to take over. Harmful bacteria produced by-products like ammonia, purines and ethionine, which can cause cancer. Deficiencies of beneficial bacteria are common especially after heavy use of antibiotics, narcotics or after a severe bout of diarrhea. The devitalizing effect caused by harmful bacteria in the intestine is rarely diagnosed. Headaches, skin infections, weakness and constipation can be symptoms of depleted intestinal bacteria. Water and juice fasting reduces intestinal bacteria as there is no pulp to live one. Fasting, using an enema with tea tree oil, sea salt, colloidal silver, can kill all intestinal bacteria and all harmful bacteria and therefor it is recommended that you take an pro-biotic after fasting to reestablish intestinal bacteria. what is the effect of fasting on our intestinal flora? will have a depleting effect. Live cultures should be a regular part of our diet anyway! We can never get too much! I’m actually on 29 Days of a Water Fast and going for 40 Days …. So help me here with breaking this fast … I heard I was suppose to on Day 41 early in the morning to drink Apple Juice but dilute it and do this for the next 7 days, just drink diluted juices. As my villi’s are not yet fully awake yet, BUT what’s this I need to replace my good bacteria in my stomach?? For real?? So your saying on Day 41 don’t eat or drink anything ?? Just take the probiotic tablets and for how many days?? And do I THEN drink diluted juices on Day 45?? Thanks.